A close relative to the ever-popular ST-180, the ST-120’s smooth-top design is one of the most rugged flex-wing brush cutters on the market today. With it’s 4” cutting capacity and 250 HP gearbox, you will be hard-pressed to find another mower that can outperform the ST-120 in the field or at the cash-register. Gearboxes – 540 RPM or 1,000 RPM Two spindle gearboxes, 250 HP, base mounted, 1:1.6 ratio. One dividerbox, 275 HP, base mounted. All gearboxes have malleable housings, forged alloy steel, carburized and hardened gears and shafts, tapered and ball bearings. 20 splined 1 3/4” input shaft, 2 3/8” output shaft on spindle boxes. Drive Shafts – Shielded PTOs made from finest quality propeller shaft materials and needle bearing universal joints. Category 5 80-degree constant velocity main drive shaft, Category 4 intermediate and wing drive shafts. Slip Clutch – Two heavy-duty clutches with spring type adjustment and four friction discs. Blades – 1/2” by 4” material, alloy spring steel, airlift design. Free swinging when encountering obstructions. 8” overlap for better cutting. Blade tip speed: 16,768 FPM. Wheels – Five solid rubber tires standard. Independent shock absorbing system for all wheel axles. Optional: aircraft tires or implement tires. Dimensions – Cutting width: 10’. Cutting height: adjustable from 2” to 15”. Overall width: 140”. Overall length: 167”. Transportation width: 80”. Cutting height for aircraft and implement tires: 2” to 17”. Transportation width: 88”. Cutting height for aircraft and implement tires: 2” to 17”. Weight – Without chains and tires: 4,260 lb. 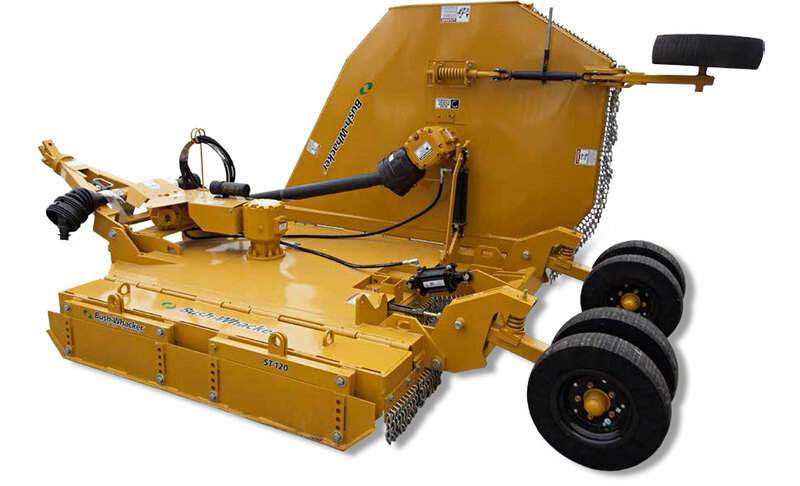 Bush-Whacker Special Deck – Bush-Whacker Special Deck features a primary (bottom) deck of 7 gauge steel that is welded to heavy duty channel structures. The smooth, easy-to-clean top deck is made of 12 gauge steel that protects the inner support frame. The combined deck thickness is .2921. Hydraulic Adjustments – Hydraulic lift cylinders control raising and lowering of flexible wing (winch assembly for manual wing lift is optional). Wing may be raised to 88 degrees above horizontal and lowered to 22 degrees below horizontal cutting plane. Optional: rephasing level lift systems. Other Standard Features Include – Replaceable center and full length wing skid shoes, transport locking bars for each wing, heavy-duty tongue assembly with dual leveling rods, hydraulic hose holder, parking jack for easy hookup and unhooking from tractor. Specifications listed are standard; however, any State Department of Transportation specifications that may differ from standard Bush-Whacker® specifications will take precedence and be implemented into production. Rated to cut-up to 4” diameter brush. Hinges 3” x 4” tubing with grease fittings. Hinges — Structural tubing with grease fittings. 8-bolt mounting on gearboxes — bolt-heads are tack-welded to bottom of deck so one person can tighten the nuts or change the gearbox. Hall Manufacturing provides a limited warranty of one year on any machine or component, and five years on any mechanical gearbox or gearbox component. 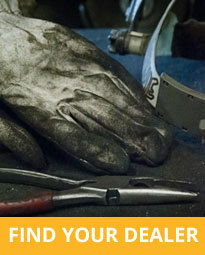 This warranty covers defective materials and workmanship on the complete machine. Limitations and exclusions apply.